Coffee shops are trying a new form of coffee making on their customers with the use of SmartCup Xpress, a revolutionary way to get your pick-me-up on the go with a gourmet and robust flavor. One store in New York City, BKoffie, uses the Xpress cups to sell their delicious coffee from African beans. 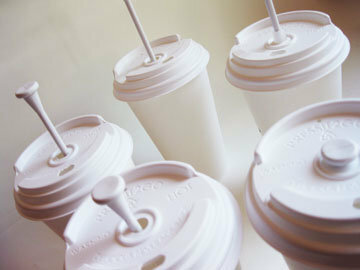 The cups act as a disposable French press, with a lid and plunger to do the job. The barista adds the coffee, water and sugar if desired to the cup, fastens the lid and the customer is on their way to a fresh brew in about three minutes. At this point you are able to add condiments like half and half or milk. For about the same price as a latte or Americano, coffee drinkers are now able to enjoy the full robust flavor of the drink the way it was meant to be brewed, in a French press. All of the flavors are contained in the brew because the grounds are pressed with a mesh, rather than paper. If tea is your choice the Xpress cup works well with loose tea. This is an entirely new concept for French press coffee to go and only time will tell to see the feedback from customers on whether they prefer a regular brew or the Xpress style.